Let the Big Foot take a bite out of oxidation! 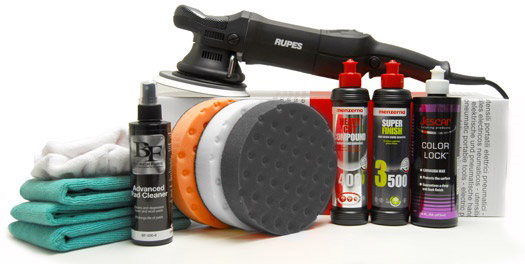 Rupes LHR 21ES Marine 31 Boat Oxidation Removal Kit puts the power of the Rupes LHR 21ES Big Foot Random Orbital Polish in your hands to make restoring severely neglected gel coats easy. How easy? The Rupes Big Foot Random Orbital Polisher features a huge 21 millimeter throw that allows it to work up to 40% faster then other random orbital polishers while still retaining all of the safety benefits. Even a beginner can achieve expert results after a few sections. When combined with the included Marine 31 polishes and Lake Country CCS pads, the Rupes LHR 21ES Big Foot Random Orbital Polisher makes removing a chalky, oxidized surface from your boat fast and easy. To protect the shine you have created, the Rupes LHR 21ES Marine 31 Boat Oxidation Removal Kit includes Marine 31's Carnauba Wax + Sealant and Wax & Shine Detail Spray. These ecologically friendly products will help you keep your boat looking great no matter the seas that lay ahead. The Rupes LHR 21ES Big Foot Random Orbital Polisher is an extreme orbit, powerful and supremely engineered dual-action random orbital polisher. Dual-action random orbital polishers, often called DA's, are known for their ability to safely polish gel coat without burning it. Because of their unique polishing action, dual-action random orbital polishers create a high-gloss finish that is free of circular scratches or buffer swirl marks. The Rupes LHR 21ES Big Foot Random Orbital Polisher retains the benefits of traditional DA polishers while offering a tremendous increase in polishing power. The LHR 21ES Big Foot is makes it possible to completely polish your boat faster than other random orbital polishers. Total retail value of $599.88. You save $99.89!